Why in America should the most sinister of European social diseases have taken root? Why should that disease have spread from its seemingly anachronistic beginning in the Gilded Age until it infected many of our great magazines and newspapers? Until it determined not only where a man might stay the night, but where he got his education and how he earned his living? This book answers such questions by exposing the myths with which the anti-Semite surrounds his position. By taking away the "mask of privilege" it reveals the source of such prejudice for what it is--the determination of the forces of special privilege, with their hangers-on, to maintain their select and exclusive status regardless of the consequences to other human beings. 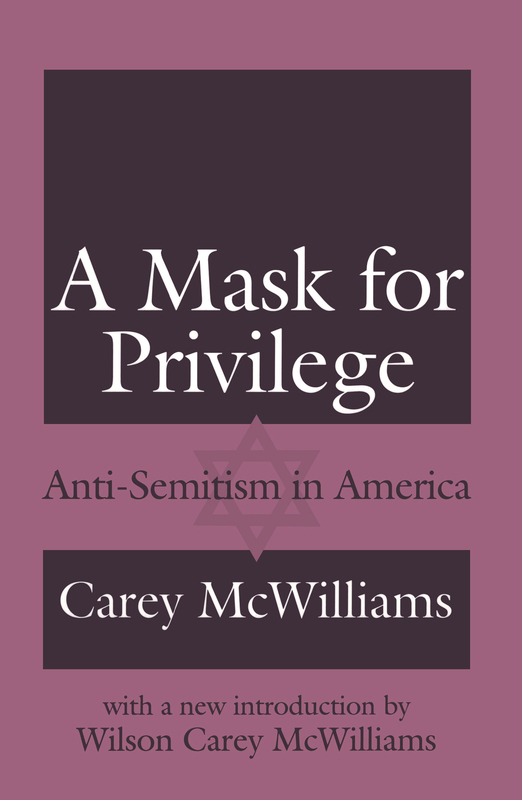 Like Carey McWilliams's other books on minorities in America, 'A Mask for Privilege' reveals the facts of discrimination so that the fogs of prejudice may be dispersed by the truth. It traces the growth of discrimination and persecution in America from 1877 to 1947, shows why Jews are such good scapegoats, and contrasts the Jewish stereotype--"too pushing, too cunning" with that of other minority groups. Then it looks at the anti-Semitic personality and concludes, with Sartre, that here is "a man who is afraid"--of himself. In his stirring new introduction, Wilson Carey McWilliams calls this a work of recovery "evoking names and moods and incidents now either half-forgotten or lost to memory." This brilliant analysis of anti-Semitism is a documented and forceful attempt to inform Americans about the danger of the undemocratic, antisocial practices in their midst, and to suggest a positive program to arrest a course too similar to that which led to the Holocaust. It transcends majority-minority relations and becomes an analysis of antidemocratic practices, which affect the whole fabric of American life.